2019 will be a dynamic year for the Noel School. We are installing a clean water system and washrooms with flush toilets. Through our relationship with Engineers Without Borders and the Omani Foundation along with private donors who understand the critical need for clean water for children to be educated and thrive, we are able to get this done. We brought volunteers to Kenya in June, 2018 who were key in the work at the Noel School. We taught the teen girls how to sew washable sanitary pads that will allow them to stay in school during menses. In addition, WLUF delivered 900 textbooks to the children, and most recently have started the planning and fundraising for a clean water well system as well as permanent washrooms with a septic system. Recently with the help of Convoy for Hope, the teachers and children have been sent packaged food that will last one term. We brought water filters and watched children drink the pure clean water and instructed the teachers how to correctly use and clean the filters at the Noel School. Over the past 3 years, at the Noel school, we've begun self-sustainable projects that focus on hygiene, nutrition and education. We've built a latrine, provided funds for dried beans, millet and other resources for lunches and assisted with medical and classrooms. Most recently, a donor provided two 10,000 gallon tubs to catch rainwater. NOW, that rainwater can be filtered to remove 99% of the germs and microbes the children have been drinking. The Noel School is featured in our documentary, Women Like Us. Three Journeys. One Mission. To Change the World. and in the recent book, Women Like Us. Together...Changing the World. The school strives to bring not only a quality education to the children in the area, but also a sanctuary and safe place for the kids who are stricken by some of life’s cruelest atrocities. The NA Noel School is a place for children to learn and grow and gives them the necessary tools to survive (like quality medical care, food, and safety) and opportunities to follow their dreams that they would struggle to find otherwise. “Love is the only thing that changes things” – Nancy Noel. A simple, yet strangely powerful quote that captures the passion and motivation behind Nancy Noels work, both philanthropically and artistically. Since its installment twelve years ago, the school has flourished into a community of growth, support, and peace. With 239 children, several teachers, and medical supplies and doctors on site, the benefits of such are innumerable especially in a land where the very real fear of AIDS and war will negatively affect any childhood. 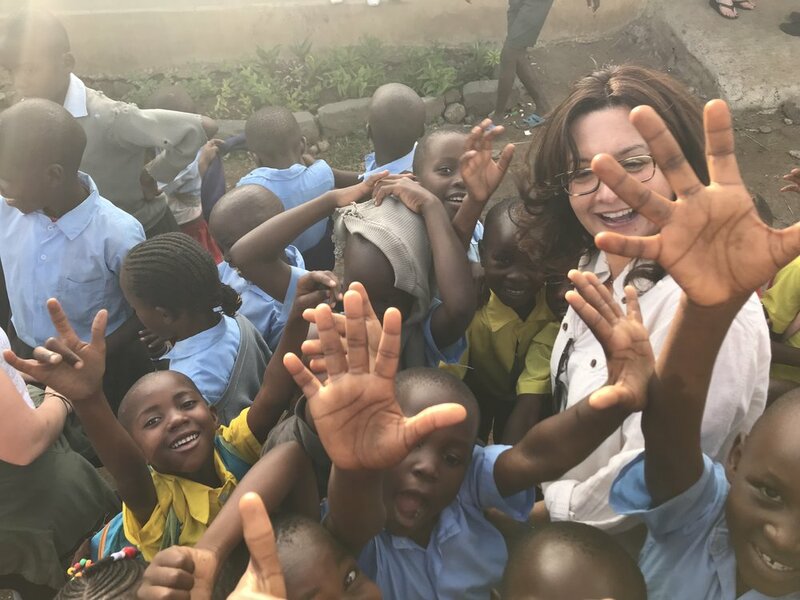 Despite the hardships that these children have to face, Nancy has seen and been inspired by their natural enthusiasm, vivacity, and perseverance. Though they may not have much in the sense of tangible items, they make up for it leaps in bounds in love. And we worked with the children, teachers and families in the newly plowed land for a future garden. Spinach and kale are the first two vegetables to give the children a healthier start to their lives. TERESA AND DANISHA WORK IN THE GARDEN WITH THE CHILDREN. THE WATER IS CARRIED IN FROM THE NEARBY LAKE. NEXT PROJECTS: SANITATION SYSTEM AND WATER TRANSFER FROM LAKE VICTORIA, TEXT BOOKS FOR ALL CHILDREN, MEDICAL SUPPLIES, INCREASE TEACHER PAY FROM $50-$150 PER MONTH FOR 15 TEACHERS. CONTINUE WITH SUSTAINABILITY OPPORTUNITIES.